Herbaceous Peony species are usually distinctly different in appearance when compared with their more ornate hybrid cousins. Nevertheless they possess a simple beauty which is a delight to welcome in late Spring and early Summer. And they are much hardier than they look. Herbaceous species can emerge from their Winter dormancy relatively early in the year, whatever the weather, although, with me, they don't begin to flower before early May. The Paeonia obovata complex occurs throughout Asia but the fact that this particular form is often referred to as The Japanese Forest Paeony provides clues both to its probable country of origin and also to its preferred habitat. It really does perform much better in semi-shade and in my experience doesn't care for heat and strong sunlight. It is not a tall plant, maybe eventually reaching a height of 50-60 cm., and although its pristine white cup shaped flowers are its most noticeable feature it also possesses very beautiful foliage and with my plants this remains a dull plum colour throughout the growing season The startling black and red of the open seed capsules offers yet another bonus. Apparently it is possible to propagate Peonies from root cuttings but I prefer to grow them from seed which is obtainable from specialist growers such as Will McLewin at Phedar Nursery. 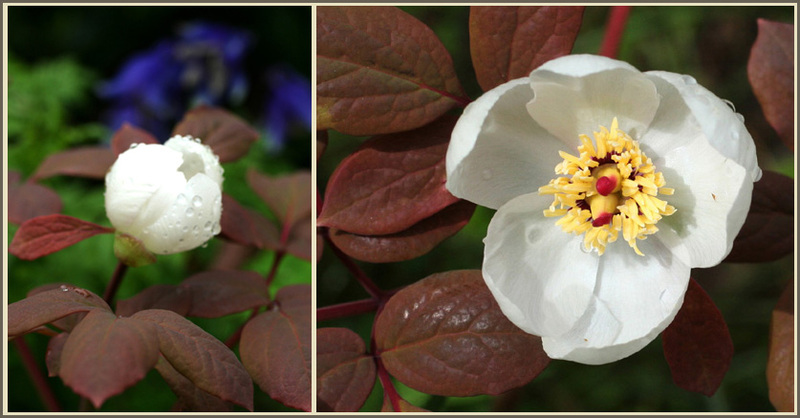 In the case of Paeonia obovata it can flower within 4-5 years of the initial sowing. But if you decide to try and grow them please remember the golden rule. Paeonies usually possess double dormancy which means that only the root emerges in the first year of growth to be followed by the shoot in the following season. So have patience, hold on to that pot !